At last we see sunshine in the Tweed Valley. 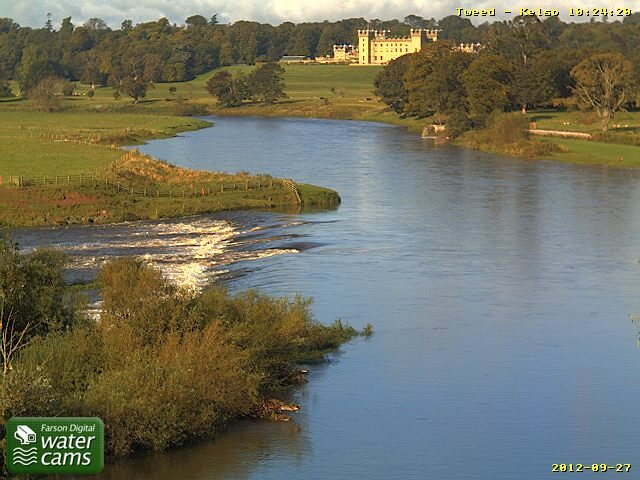 This photo from the Duncan House webcam overlooking Lower Floors shows a falling Tweed and blue sky, hurray! It’s been a tough week and it looks as though there may be further showers, but the flow has turned to come from the West and Southwest and this breeze is about to pick up again with mean speeds of around the 13 to 18mph over the next couple of days but with occasional gusts up to 30mph and up to 40mph on Sunday. This entry was posted in Uncategorized and tagged Angling, boatmen, fishing, FishTweed, River Tweed, season 2012, Tweed, Tweed Valley. Bookmark the permalink.